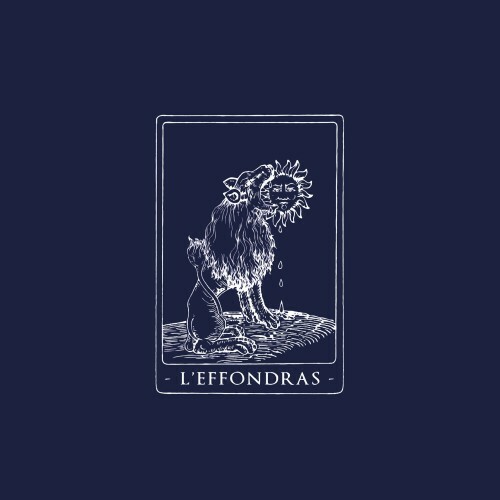 L’Effondras is the French word for ☉ and it’s the symbol (glyph) of the sun. You feel the sun burning on your head when you listen to the instrumental Post-Rock that has the vibrating nuance of the instrumental desert rockers Yawning Man. The three-piece L’Effondras doesn’t like vocals and a bass sound; they only need guitars and drums. On their self-titled debut seven songs are lasting more than an hour excluding the hidden bonus song. In a relaxed atmosphere (don’t hesitate when you are in the desert!) the trio slowly builds layer after layer with an Americana undertone. The songs evolve like the soundtrack of a silent road movie through the American desert. Especially the end parts of ‘L’Ane Rouge’ and ‘Caput Corvi I’ are heartbreaking climaxes. The three men are stretching the songs until the listener is in a different part of the planet. The only minor side of the album is the lack of ‘low’ in the sound. Bass rhythms could’ve added so much more to the minimal sound of the trio. Less is more is a strong credo but do not exaggerate. They compensate the lack of bass in ‘Caput Corvi II’ where guitar feedback is the starting point to give the song an open jazzy end. ‘L’Aure Des Cometes’ ends the record and is a typical acoustic guitar outro. The hidden bonus song is worth to mention too. After a jazzy drum oriented introduction the guitars are taking over with a grooving desert rhythm and the uplifted drums reveal a devastating climax. Groovy guitar riffs are coming back and they surely leave you dancing naked in the burning sun. Aside from the debut album L’Effondras has released the 7 inch EP ‘Ferrum Movendo / Helleboros’ in 100 copies. Two short instrumentals are included and those are straight to the point. Who want to wash away from the world and kept in a longer dream better hit the play button of the long player desert trip.